Geodesicx’s TBT enhances waterway navigation by providing the charting system with extremely accurate bearings to shore-based navigation aids in real-time, eliminating errors caused by miss-read or off-center compass cards. By transmitting the bearing information in real-time to the charting system, the latency associated with voice communications over sound powered phones is also eliminated. The True Bearing Transmitter enhances vision based navigation technology as a portable kit that mounts on both the pelorus stand and on top of the compass repeater. 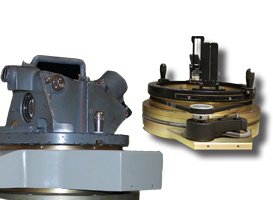 When used with the standard telescopic alidade, it can provide the true bearing of an object on shore with an accuracy of ±0.1°.